INTRODUCTION: This page is for those who are interested in learning more about the benefits of feeding your pets a raw diet. Just so you know . . . this is more commonly know as the BARF diet - no really! (Biologically Appropriate Raw Food). I know it is not for everyone and I certainly wouldn't push it on you, but if your animal has had health issues, skin problems, intestinal problems, compromised immune system, pancreatits, allergies, etc., this might be something for you to look into. 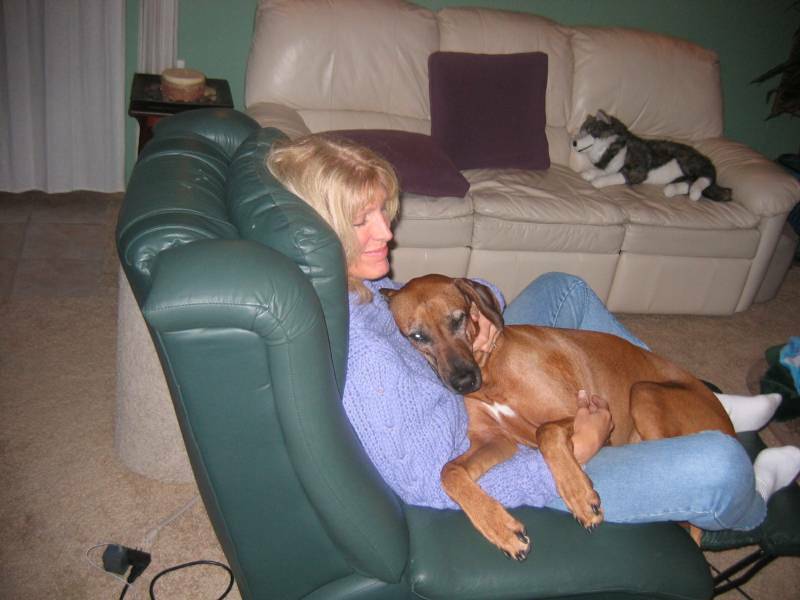 My Rhodesian Ridgeback, who lived 'til he was over 13 years old, had been on the raw diet for his whole life. (We started him on raw at 6 months). He never had a flea (we'd never given him any flea treatment), he was in very good shape and health, and had beautiful teeth from all the bones and nutrients he got from his food. In 2004 we started all our cats on the raw food. We presently use a prepared (frozen) raw food for them. When we switched, we immediately noticed the cats drinking much less water (since they were now getting it in their food). Their eating is regulated (as recommended by our vet). We feed them in the morning and evening, and they know they must eat what they want while it's there (not a problem!). When they walk away, it gets taken away. Therefore, they eat until they are full. Their weights have evened out. They poop less and it has a much milder odor. (Believe me I've cleaned many litter boxes and know the difference!) The older Abyssinian female and Siamese, who had lost many teeth from gum disease, inherent to those breeds, have had fewer tooth problems since being on the raw food. Now we start our new kittens right out on the raw food. They have taken to it wonderfully. No problem adjusting, and they enjoy munching on raw bones and carcasses, as well. It's great to watch them, as the instincts of their ancesters kick in! I have included some links on this page that will answer some of your questions, and give you more detailed information on the how's and why's of feeding a raw diet. If you would like any further information or have specific questions about the raw diet, sources for my meats or supplements, or would like the recipe I use to feed my dog, please feel free to email me. I highly recommend the book "Give Your Dog a Bone" by Austrialian Veterinarian, Ian Billinghurst. It will open your eyes to the pet food industry and give you a greater understanding of a dog's digestive system and evolution.Good luck to you and I hope you will look into this highly beneficial method of feeding your pets! !​ And don't forgot the Probiotics! after your pets have had antibiotics - gotta replace that good bacteria that the antibiotics destroy!! Your vet won't tell you this. Research it on the internet, please!! The Top 50Most Frequently Asked BARF QuestionsNewcomers Ask! “Many dogs and cats are asymptomatic carriers of Salmonellae. Clinical disease is uncommon, but when it is seen, it is often associated with hospitalization, another infection or debilitating condition in adults, or exposure to large numbers of the bacteria in puppies and kittens.” To translate: Many dogs and cats carry Salmonella in their systems (as evidenced by the presence of Salmonella in their feces), but they rarely become ill. It is just a natural part of what lives in their GI systems. When illness does occur it is usually associated with an already ill animal who is already immune-compromised. Illness may also occur when young animals are exposed to very high numbers of the bacteria. This might happen if a puppy finds and licks the inside of an outdoor garbage can that has never been washed and is teeming with bacteria.Research indicates that approximately 36 percent of healthy dogs and 17 percent of healthy cats carry Salmonella in their digestive tract.3 ..The American Veterinary Medical Association (AVMA) agrees with these numbers.4 It is interesting to note that these numbers are based on kibble-fed dogs – which means that Salmonella is a natural part of life for our pets regardless of what they are eating.The resistance to illness in dogs from Salmonella is apparent in a study of raw-fed dogs in Canada. In that study 16 dogs were deliberately fed commercial raw diets contaminated with Salmonella. None of those 16 dogs became ill. Additionally, only 7 of those 16 dogs shed Salmonella in their feces.5 While it was not further studied, one might speculate that the 9 dogs who ate Salmonella-contaminated food but did not shed it in their feces effectively neutralized the bacteria.Even the FDA, in the FDA Consumer magazine, acknowledges that healthy pets rarely become ill from Salmonella contamination.